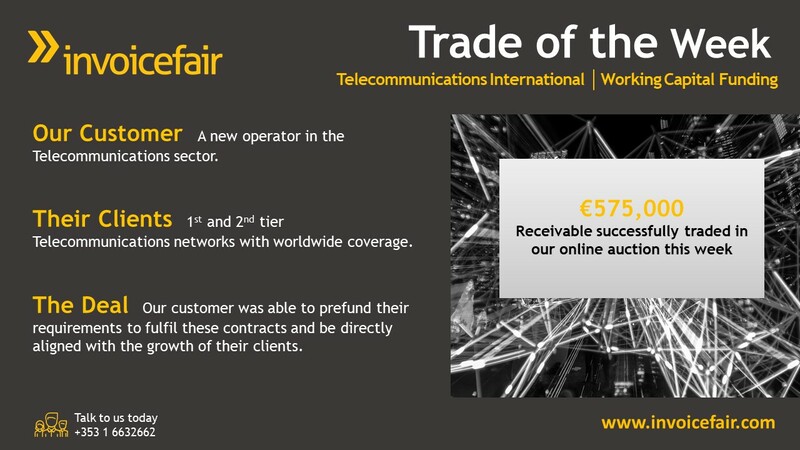 Our trade of the week features an emerging operator in the telecommunications sector. An invoice of €575,000 was successfully traded in our online auction this week within 24 hours of approval. The trade features an SME that is quickly establishing itself in the telecommunications sector. This SME is in high demand with their clients, 1st and 2nd tier telecommunications networks with world wide coverage. In our daily auction we trade future receivables for established SMEs across all sectors in Ireland & the UK. If you would like to discuss how we can partner to scale your business, contact Sorcha Mulligan at Sorcha@invoicefair.com or call +3531663662.